Product #18289 | SKU K3A032 | 0.0 (no ratings yet) Thanks for your rating! 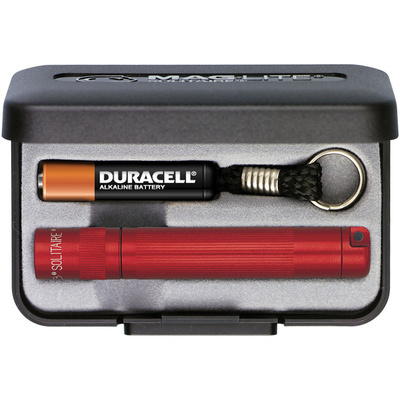 The Solitaire 1-Cell AAA Flashlight with Presentation Box (Red) from Maglite has a very compact, lightweight, and durable design made in the USA. The Solitaire features a bright and adjustable spot to flood beam, and is powered by a single AAA battery that provides 3.75 hours of operation. Constructed out of an anodized aluminum alloy, the Solitaire is corrosion resistant, impact resistant, and weather resistant. Weighing only 0.8 oz it is the perfect size to carry with you and comes with a key lead and presentation box. With the dependability of the Solitaire on your keys, you never have to be without light again.